The “What the feck do I feed the baby for tea?” feeling hit around 4pm today, we’ve had a busy week and there were no left overs in the fridge for once. We had been swimming today so he needed something more than just toast but I wasn’t up for a full scale cooking or cleaning event. When I don’t know what to cook for the grown ups I cook “fridge surprise” which is usually pasta with a sauce made up of what ever is the in the fridge – or sometimes it’s a stir fry or when things are really barren in there, it’s hat old classic – an omelette. 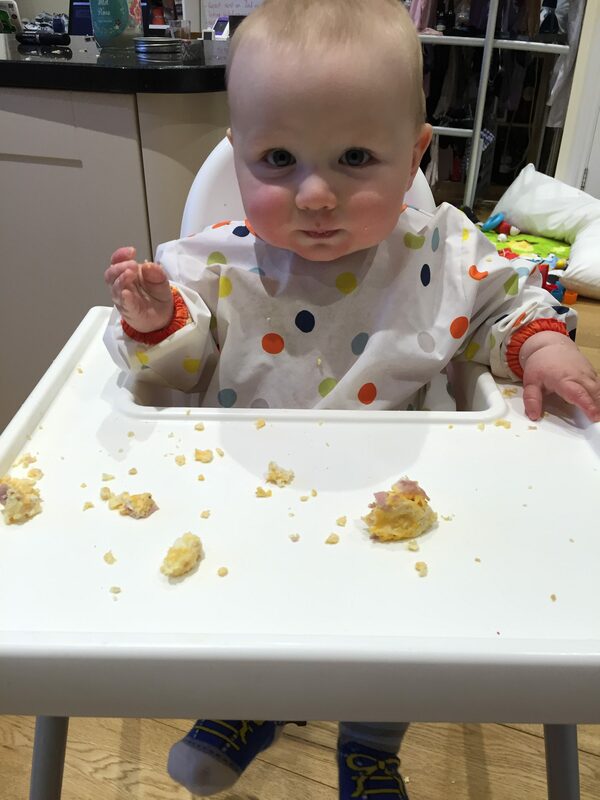 As we’re doing baby led weaning and the baby has what we have, it waas time for baby fridge surprise! EDIT: I did this again without the milk and it was fine! I added green pepper this time – that worked well, he wasn’t too sure to start with but got into it! – Turn out onto a plate, let cool, cut into “fingers” or chunks.